The Page Properties allows you to change several important page-specific details for each page of your site, controlling such things as what it's called, whether or not users can see it, and how it is represented to search engines. Options include . . . Page Name - the name of the page as it appears on the menu. This can be changed at any time, but it's wise to keep this short and punchy. Limited to 20 characters to prevent unsightly wrapping on left menus sites. Protected: the page is displayed on the menu only for logged-in administrators. This lets you create a protected page at your own pace, then make it public only when you're happy with it. Switched Off: the page is not shown on the menu or accessible through links, and the address redirects to the Home page. Page Layout - this facility lets you turn off the right column on pages to provide a wider content area. [only available if you have upgraded to Spanglefish GOLD]. Add Gallery/Shop - this lets you easily add a formatted grid of images to a page, which can be used just for display purposes, or linked to your paypal account if you have one, to provide a simple online shop. 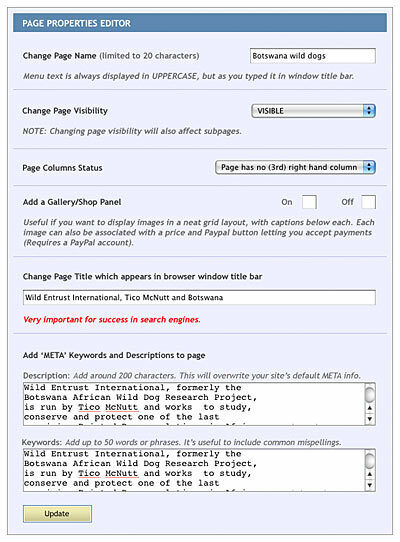 META Page Title, Description & Keywords - very important for search engines! This lets you tailor the title that appears at the top of your browser window, the description used by Google when displaying a page in results, and the Keywords embedded in a page's code. In these days of exceptionally powerful search engines, keywords are seldom worth bothering with unless you are in a very competitive sector, but descriptions, and especially the window title, are well worth doing properly for each page on your site. If you'd like to learn more about how search engines work and what you can do to boost your site, take at look at our search engine quickstart.